Just back from Kona and getting caught up, with more observations about traveling with a Macbook Air. As I’ve written, the computer does what it should, it’s not limited by the processor or graphics card. I ran a full compliment of software including iPhoto, Final Cut Express, and VMware fusion. In context to cycling, the Air is like a light climbing bike – purpose built and does what a bike should, but I wouldn’t use it to carry cargo or bang around in a crit. Just like a climbing bike, the lightness is apparent and that’s just in pulling it out of my hugga bag, grabbing it to check Google maps, or uploading photos to Flickr. As Ultra-light portables go, Apple made its decision to have a 13-inch screen and full keyboard. For the work I do when traveling, I think those are the right choices. It’s one of the best keyboards I’ve typed on and the LCD is outstanding. As for peripherals, I used a mini-travel hub and connected the iBike Pro and Sony HDR-TG1 to it. 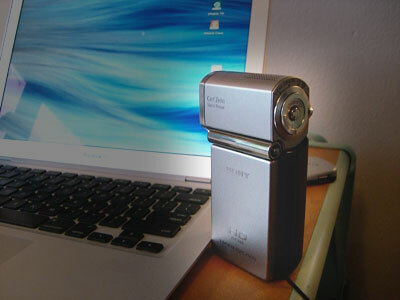 The Sony is a HD handycam that records to a memory stick. I’ll blog more about that shortly with our next HD huggacast featuring scenes from Kona. The next trip is to SXSW for our Mobile Social. I’ll have the air with me and the Modal Travel Bike.